Summary: A 2018 ABA report on community bank CEO priorities reports only 17% of community banks currently offer insurance products. Could this be an opportunity for your bank? All banks want more customers, and mobile banking is a good way to get them. The key in all of this of course is to deliver a service customers want. That is why we share here the key reasons millennials said they abandoned mobile banking, from a Jumio survey. Those were: process too long (38%), forgot password (27%), authenticating myself was too time consuming (22%), process too complicated (19%) and difficult filling in forms on my mobile device (18%). This may give you some areas of focus, as you look to improve and ensure your mobile process is strong. As you en-sure that happens, we shift to in-surance as our topic today. Of course, selling insurance is complex, which is why most community banks avoid doing so. However, perhaps selling insurance products may represent a natural and financially beneficial extension for your business. All financial institutions are grasping at ways to increase the number of products and connections they have with good customers, in order to increase retention and improve customer satisfaction. Insurance products may represent another route for community banks to build deeper, stronger links. According to the recently released ABA report on Community Bank CEO Priorities for 2018, only 17% of community banks currently offer insurance products. That said, an estimated 83% of surveyed community bankers plan to offer insurance products within the next year. While several community banks have offered insurance in the past, there are many things to consider. Much like financial technology players, insurance technology developers (dubbed "insurtech") are looking to work with banks of all sizes in order to improve the process and make it more digital. More consumers are using their mobile devices to shop for various kinds of insurance, so making sure you are in front of them when they have a need to fill is important. Done right, insurance can be a product that, in one form or another, every customer will require at some point. Whether for their car, home, or business, this could also be an opportunity. Financial institutions of all types are still seen as a more trustworthy and reliable source for obtaining insurance than a non-financial vendor. Further, since the lion's share of insurance sales and claims are handled in-person and by phone, your bank may be able to leverage your customer service advantage over bigger players. 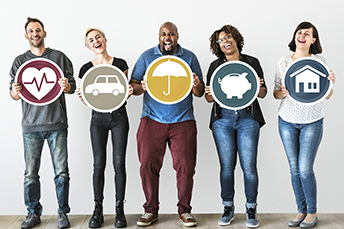 While not every community bank will want to venture into a new product offering such as insurance, it could be worth a look perhaps. Talk to the experts and your customers to better understand the opportunity and the risks. Who knows? You could find a new way to grow and keep your customers happy at the same time. 1) Capital One ($408B, VA) will acquire online shopping comparison engine Wikibuy for an undisclosed sum. Wikibuy provides price comparison in real time, get coupon codes at checkout and receive price drop alerts on products and services to its more than 1mm members. As hoped, the FDIC has released a proposed regulation that would allow banks with assets <$10B to elect the community bank leverage ratio framework if they meet the 9% ratio (plus some other components). Regulatory agencies have proposed raising the appraisal threshold for residential real estate transactions from $250k to $400k.